« Three World Class Flat Track Racers Chosen For The 2017 Indian Wrecking Crew. First Factory Racing Effort Since 1953. Only One Thing Between You And The Road. The Lightweight Wedge II Fairing For Mid-Sized Motorcycles. Published by Cyril Huze September 27th, 2016	in Accessories, Chassis and Customs. 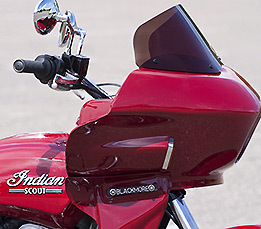 Riders who purchased The Wedge Fairing from Blackmore Manufacturing found it to be a great addition to a mid-sized motorcycle. The frame-mounted design provides a stable ride, excellent wind protection, and storage – all in a compact package designed for a smaller motorcycle. Looking for ways to improve their product, the builders and designers of The Wedge found only one. Rather than fiberglass, the Wedge II fairing is injection molded from TPO, an advanced version of ABS. The new material and manufacturing process allowed the designers to improve their product in significant ways. 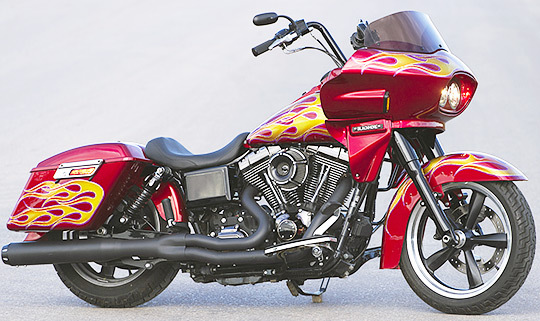 The list of bikes a Wedge II Fairing will fit include Harley and Indian models. Harley Sportster, Dyna, FXR, V-Rod and Indian Scout with more to come. The Wedge II provides the same stability and wind protection as the original, yet it weighs less, offers increased storage, easy installation of radio and speakers, and a finished surface that requires very little prep before painting. The Wedge II offers four windshield options from 7 to 18 inches and headlight rings and turn signals that come in standard black or optional chrome. The Wedge II is without question the best frame-mounted fairing on the market today; and available from your dealer, or online at Wedge Fairings. I like it. What is the MSRP? $1995 +s&h not bad for a frame mount . 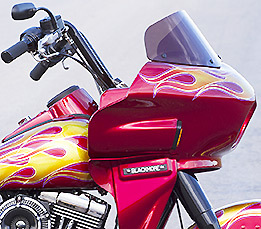 I’m the one that owns the red flamed bike and I have to tell you this fairing is an awesome addition. Wow flashback to the 70’s, is that a Vetter Windjammer? What will they reinvent next? I hope it is two stroke performance motorcycles!